Rdio, the social music startup founded by Skype founders Janus Friis and Niklas Zennstrom, is expanding its platform today with the launch of its API and an affiliate program. Rdio launched last year as an unlimited, on-demand social music service that allows users to build and share online music collections from a catalogue of over 8 million songs. Rdio offers a Web-only music streaming music service for $4.99, and a premium version that adds mobile access for $9.99 per month. Now, Rdio’s API gives developers the ability to create web apps that can search, access and play all of the artists, songs, albums, playlists, and charts in Rdio’s catalog of over 8 million songs. The open platform includes an oEmbed API, REST API, and Web Playback API and allows developers to access community-only features such as the ability to see what’s in heavy rotation in your network, follow people whose music tastes you like, check out other people’s music collections and modify a personal collection or playlist. Rdio also plans on releasing a playback API for iOS and Android in the future. Unlike other APIs, this one is tied to a subscription service and users who do not sign up to use Rdio (either as a subscriber or a trial user) won’t get the full benefits of the API. Whether that is enough to cripple the API remains to be seen. So visitors on third party sites using Rdio’s API will be able to stream full length songs, whether they are a subscriber or a trial user. Users who are not subscribers or trial users that encounter the Rdio API on third-party sites will be able to hear 30-second song excerpts. These users will also be given the option of enlisting in a free 7-day trial (no credit card required) to hear the full song. Additionally, developers will be able to monetize their applications through a new affiliate program which will pay commissions for referring new subscribers and song downloads. Affiliates can earn two to three percent gross revenue per month for the lifetime of a new subscriber and seven percent gross revenue per song download referred. Todd Berman, VP of Engineering at Rdio says that an API has been the startup’s most requested feature. 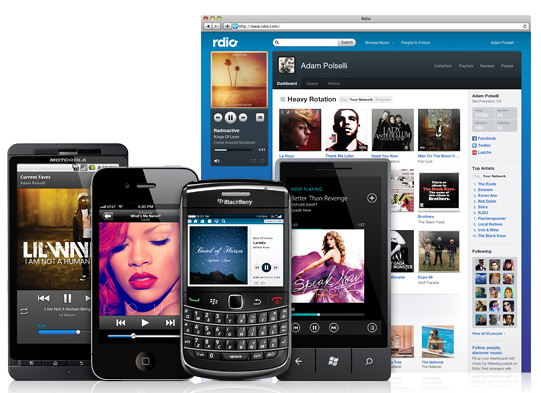 Rdio’s API is already being uses by a number of web companies, including AOL’s new Play app, Tweetlouder, and The GRAMMY Awards’ MusicIsLifeIsMusic microsite. Rdio, which just raised $17.5 million, in new funding, has made it to the U.S. (albeit with a different model) before much hyped competitor Spotify. And Google Music, the search giant’s music service has yet to make its public debut. Rdio is probably smart to start wooing developers and expanding its ecosystem and reach before these competitors launch.